A new type of exploding star has been discovered by an international team of scientists that includes Penn State University astronomer Derek Fox, an assistant professor of astronomy and astrophysics. Until now, scientists had observed only two basic kinds of exploding stars, known as supernovae. But now the team's discovery has revealed a third type of supernova that, if common, could reveal a previously unknown source of the calcium in our bodies and of the positron particles observed near the center of our Milky Way Galaxy. Positrons previously have been suggested as indicating of the presence of "dark matter." The discovery was published in the May 20 issue of the journal Nature. 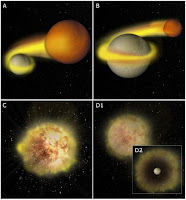 The two previously known supernova mechanisms involve either an old, dense "white dwarf" star whose death occurs in a powerful thermonuclear disruption, or a hot, young giant that explodes in a violent display as it collapses under its own weight. The new, comparatively dim, supernova appeared in telescope images in early January of 2005, while Fox was a researcher at the California Institute of Technology (Caltech). Seeing that the supernova, named SN 2005E, recently had begun the process of exploding, Fox and other scientists around the world started collecting and combining data from different telescopes, measuring both the amount of material thrown off in the explosion and its chemical makeup. "We soon found that the new supernova did not fit either of the known patterns, but it took quite a long while to sort out all of the aspects of this supernova that make it so interesting," Fox said. He and other scientists formed the team that produced the Nature paper, led by Hagai Perets and Avishay Gal-Yam at The Weizmann Institute of Science in Israel. While a researcher at Caltech, Fox help to conceive and lead a yearlong program devoted to joint imaging and spectroscopic studies of bright supernovae. SN 2005E was one of the objects selected for studies under this program, which helped to reveal its identity as a new type of supernova. The scientists found that, on the one hand, the amount of material hurled out from supernova 2005E was too small to have come from an exploding hot, young, giant star. In addition, its location, distant from the regions filled with dense gas and dust where new stars form, implied it was an older star that had had time to wander far from its birthplace. On the other hand, the mysterious object's chemical makeup didn't match that commonly seen in the other well-known type of supernova, a white-dwarf explosion. "It was clear," says the paper's first author Perets, "that we were seeing a new type of supernova." The scientists turned to computer simulations to see what kind of process could have produced such a result. The common type of exploding white dwarf (a type Ia supernova) is made up mainly of carbon and oxygen, and the chemical composition of the ejected material reflects this composition. The newly-discovered supernova 2005E had unusually high levels of the elements calcium and titanium, which are the products of a nuclear reaction involving helium, rather than carbon and oxygen. Scientists never before had seen a spectrum like this one. Where did the helium come from? The unique chemical composition of this explosion held an important key to understanding it. The simulations suggest that a pair of white dwarves are involved; one of them stealing helium from the other. When the thief star's helium load rises past a certain point, the explosion occurs. ""The donor star may have been completely destroyed in the process, but we're not quite sure about the fate of the thief star," said Gal-Yam. The scientists believe that several other previously observed supernovae may fit this pattern. In fact, the scientists say these relatively dim explosions might turn out to be not all that rare, which could explain some puzzling phenomena in the universe. For example, because almost all the elements heavier than hydrogen and helium have been created in supernovae, the new type could help to explain the prevalence of calcium in both the universe and in our bodies. It might also account for observed concentrations of particles called positrons in the center of our Milky Way galaxy. Positrons are identical to electrons, but with an opposite charge, and some scientists have hypothesized that the decay of yet unseen "dark matter" particles may be responsible for their presence. One of the products of the new supernova is a radioactive form of titanium that, as it decays, emits positrons. "Dark matter may or may not exist," says Gal-Yam, "but these positrons are perhaps just as easily accounted for by this new type of supernova."